BREAKING=> San Juan Mayor Invited to FEMA Command Center Several Times - Refused to Show Up! BREAKING=> San Juan Mayor Invited to FEMA Command Center Several Times – Refused to Show Up! The liberal media is pounding President Trump over the suffering in Puerto Rico after Hurricane Maria. 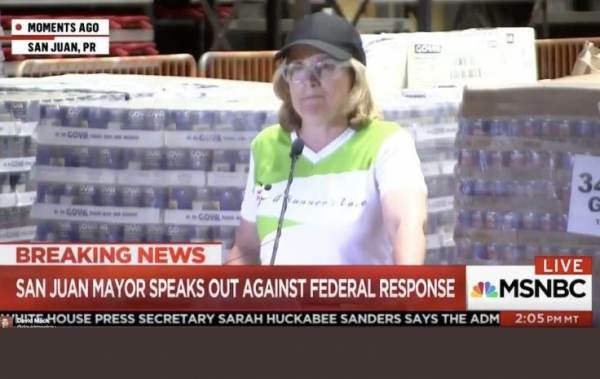 The San Juan Mayor slammed President Trump for ignoring the suffering people of Puerto Rico. She said this while standing in front of pallets of US aid from the mainland. Now we know why the people have no aid. The Teamsters Union drivers did not show up to work. Only 20% of drivers arrived at the ports to distribute the relief supplies. The San Juan Mayor has been invited to the FEMA Command Center SEVERAL TIMES — She has refused to show up!